So I look down at my Droid one night last week, and there’s a nasty Tweet directed at me by Nick Denton. Nick is a famously-cantankerous (and very successful) blogger, and owns the Gawker Media family of blogs. Gawker includes in its stable Gizmodo, one of the more influential geek/gadget blogs around. Or maybe it wasn’t actually Nick Denton, but because the folks who follow the @not_nicknotned Twitter account are Nick Denton’s peeps, I presume that the nasty note I received really was from Denton or someone on his payroll. The anger I provoked in Nick Denton or someone close to him seems to have been based on my “You Have Been Warned” post from a couple of weeks back. In that post, I called out Gizmodo employee Tony Kaye for his position regarding a comment I had left at Gizmodo. Things escalated. Tony Kaye started a thread attacking me. And by the time the whole is-that-Nick-Denton-or-is-it-someone-pretending-to-be-Nick-Denton thing flared up, a couple of Tony Kaye’s buddies were paying attention, and they started trashing me on Twitter, too. I don’t care what you think of Tony Kaye. 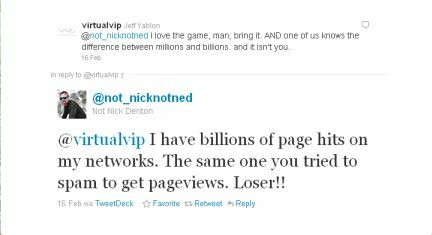 Or of Nick Denton. I’ll be honest: I was a little bit shaken by the lengths that someone on the Gawker Media family went to to trash me, but I’m not telling you this story to vent or to retaliate. I’m telling you this story because despite the vitriol, it all played out in a way that helps me. Our SEO juice and traffic are climbing more than they would have without Nick Denton and Tony Kaye getting angry. And by the way, something I predicted has come true: Answer Guy Central now ranks quite highly for the phrase “Tony Kaye Gizmodo”. I’d prefer the good kind of press. In vigorously pursuing Search Engine Optimization results for our clients, we never do anything that isn’t white hat. But when the bad stuff comes, you make the best of it, so thanks, Nick, Tony, and pals. And that’s Search Engine Optimization. It’s long-tail marketing. It’s how the Internet works. Looking for help with your Search Engine Optimization? You Can Contact The Answer Guy, Here.